Headers and Footers for PDFs. Master PDF Editor allows to add headers and footers into PDF documents. This elements may contain text, page number or date. 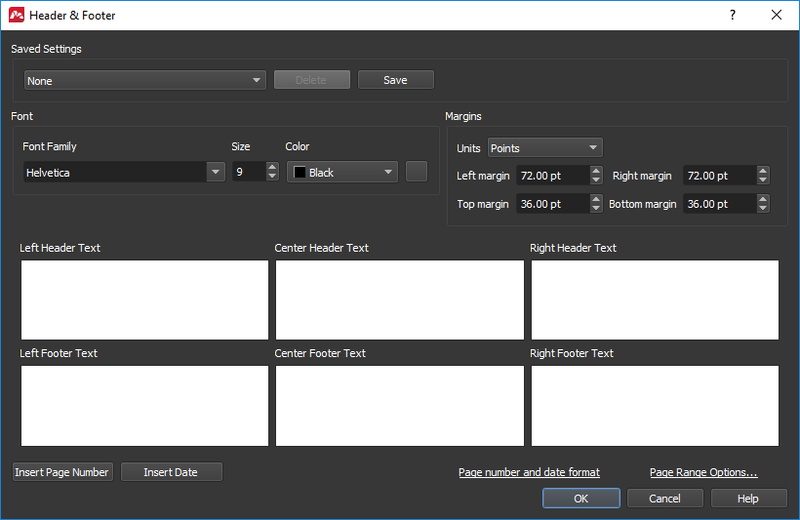 For convenience, each header and footer fields are divided into left, right and center. For headers and footers it is possible to set size, font, style, color and specify numbers of pages where headers and footers will be shown. Different headers and footers may be used in single document, and their settings can be saved for later usage. To add headers and footers to PDF document use Document –>Header and Footer –>Add. Saved Settings: List of saved customized headers and footers. To add another template, specify required settings and press Save. Specify template name in the new dialogue window. To remove template, choose it in the list of the saved templates and press Delete. Font: Set font family, size and color, or underline text to highlight it. Font settings are applied to all headers and footers in the document. Units Choose units to specify distance. Left margin — distance from document edge to the left edge of header and footer. Right margin — distance from document edge to the right edge headers and footers. Top margin — distance from document edge to the header. Bottom margin — distance from document edge to the footer. Text: Insert headers and footers text. Insert Page Number: Add page number to header or footer. Insert Date: Add date to header or footer. Date Format — set date format. Page Number Format — set page number format. Start Page Number — set first number to begin page count with. Page Range Options…: Specify page range to add headers or footers. Remove all headers and footers. To remove headers and footers use Document –>Header and Footer –> Delete menu item. All headers and footers in the document will be removed.